Dimitar Berbatov keeps the ball away from Jamie Pace. A tactical change, the inclusion of more ball players and a more confident approach to the game had the desired effect for Malta but a late collapse tarnished their performance in yesterday's friendly against Bulgaria. Indeed, a morale-boosting result looked well within Malta's reach as John Buttigieg's men managed to overcome the setback of conceding a fifth-minute goal with a deserved equaliser on the restart. Malta had created a hatful of scoring chances as they pushed forward with renewed purpose but when Bulgaria regained the lead 15 minutes from time, our team unravelled like a pack of cards. A 4-1 defeat is hard to stomach but the final scoreline was harsh on Malta who looked dejected as they walked off the Hibs Ground pitch. The game was preceded by a minute's silence in memory of former Hibs striker Charles Cassar. George Mallia received a belated call-up as a replacement for the flu-stricken Ivan Woods. The returning Daniel Bogdanovic and Andrei Agius were thrust straight into the thick of things while Steve Bezzina, one of three uncapped players in Buttigieg's squad, made his debut for Malta. Buttigieg switched to a more offensive 4-4-2 formation with Bogdanovic partnering Michael Mifsud in attack. In central midfield, Jamie Pace was flanked by Ryan Fenech who received the nod ahead of captain Gilbert Agius. Stanimir Stoilov, the Bulgaria coach, picked a strong team featuring the likes of Dimitar Berbatov, Valeri Bojinov and Stiliyan Petrov. The match was barely two minutes old when Berbatov released Bojinov in the Malta box but the latter's effort was parried away by Andrew Hogg. Malta failed to heed the alarm signals as Bulgaria stormed ahead . Petrov caught the Maltese defence unawares with a peach of a through-pass towards Bojinov who sidefooted the ball past Hogg. The timing of Bulgaria's opener was a kick in the teeth for the home team but the white-shirted players made a bold reaction. A shot by Kevin Sammut was saved by Nikolay Mihaylov who was prominent again seconds later when keeping out Jamie Pace's close-range effort. On 15 minutes, Roderick Briffa, yesterday deployed at right-back, made headway on the flank and picked Clayton Failla whose shot was deflected onto the side-netting. Two minutes later, the woodwork denied Berbatov what would have been a spectacular goal as the Manchester United striker's sweetly-struck volley rattled the crossbar. A minute past the half hour, Chavdar Yankov slipped the ball to Berbatov who was one-on-one with Hogg but the Malta goalkeeper denied the Bulgaria captain. When Bogdanovic intercepted a mishit pass in the Bulgaria half, danger loomed for Smailov's team. Sammut quickly directed the ball to Mifsud who sped forward but his central effort was saved by Mihaylov. Suddenly, Malta found a new lease of life. Sammut's deft flick released Failla who crossed towards the far post but Said slipped as he was about to conclude. Bulgaria tried to break on the counter but a long pass was booted away by Hogg whose clearance fell at the feet of the unmarked Pace in the box but his shot was touched away by Mihaylov. The second half was less than a minute old when Malta levelled the score. A long pass from Pace looped over the back-pedalling Bulgarian defenders and into the path of Mifsud who surged forward, dribbled Dimitar Ivankov, who substituted Mihaylov, and steered the ball home. At the start of the second half, Shaun Bajada came on for Failla, and 11 minutes later, Edward Herrera earned his first cap for Malta when replacing Sammut. Herrera almost made an instant impact as his inviting cross from the right fell to Mifsud whose point-blank header dropped inches wide. Paul Fenech also made his international bow when he entered the fray, taking the place of Ryan Fenech. Bulgaria restored their lead 15 minutes from time, Berbatov beating Hogg from routine distance after exchanging passes with Valeri Domovchiyski. 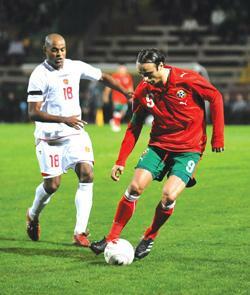 With this goal, Berbatov equalled Hristo Bonev's record of 46 goals for Bulgaria. Fenech was lucky to stay on the pitch when he pulled back the goalbound Yankov. The Malta midfielder received a yellow card but Georgiev punished Malta as he despatched his free-kick past Hogg. With Malta now in a state of disarray, Bulgaria ran riot. Berbatov was on target again after capitalising on another defensive mistake by Malta. A. Hogg, C. Failla ('46 S. Bajada), B. Said, A. Agius, R. Fenech ('62 P. Fenech), R. Briffa, M. Mifsud, D. Bogdanovic ('71 G. Agius), S. Bezzina, K. Sammut ('56 E. Herrera), J. Pace ('81 G. Mallia). N. Mihaylov ('46 D. Ivankov), V. Minev, S. Angelov, B. Georgiev ('86 I. Ivanov), C. Yankov D. Berbatov ('87 D. Rangelov), S. Petrov ('46 I. Bandalovski), V. Bojinov ('46 V. Domovchiyski), S. Manolev ('64 I. Stoyanov), G. Sarmov, Z. Milanov. Yellow cards: Bogdanovic; Milanov; Pace; Fenech. Malta players' ratings: Hogg-7, Failla-6, Said-6, A. Agius-6, R. Fenech-6, Briffa-6, Mifsud-6, Bogdanovic-6, Bezzina-6.5, Sammut-6, Pace-7. Subs: Bajada-6; Herrera-6; P. Fenech-5; Agius; Mallia.